At Rising Song children are given the trust, freedom and support to play, imagine and create. 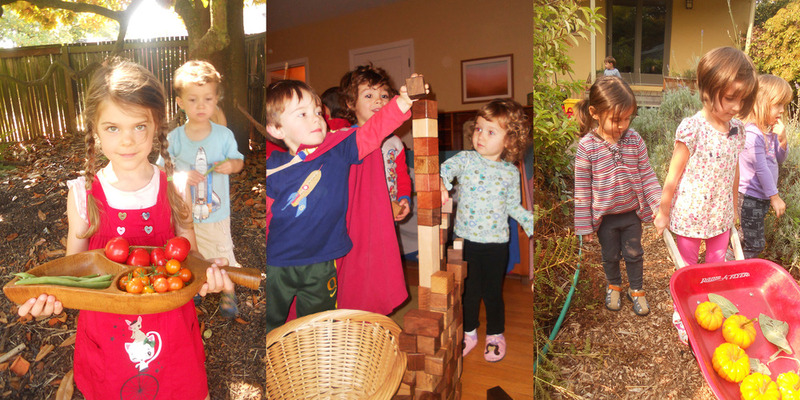 Rising Song is a nature-based, Waldorf-inspired preschool, open Monday-Thursday from 9:30-1:30. Located in a beautiful and private half-acre garden, we spend over half our day outside. Opperating with a low student/teacher ratio of 7:1, the classroom is mixed age, serving children 3 to 5 years old. What if your child’s preschool could be a therapeutic experience of nature, an opportunity to develop social skills and emotional connection, as well as physical literacy and risk assessment abilities? We spend over 2 hours outside (rain or shine) in a beautiful half-acre outdoor classroom. Each child plans, plants and tends their own garden plot and together we harvest fruits and vegetables from the greater garden. We make assorted plant medicines, build forts, climb and swing from trees, roll down hills, jump from various heights, find “treasures” in a rock sensory bin, dig sand pits and channels for water play, hammer nails into stumps, turn over rocks to discover the wonder of worms and beetles, make “soups” from fallen leaves and calendula petals, sing songs and gain the skills to peacefully solve problems along the way. In our loving, family-like community older children act as gentle guides for their younger friends. Play is at the heart of our program. In our classroom opportunities are provided that promote the social-emotional growth of the young child. Through play children develop problem-solving skills, practice cooperation and learn to communicate their needs and feelings. The teacher acts as a facilitator of play, guiding children through the process of conflict resolution and offering gentle, nurturing support as children gain confidence and move towards independence. Children determine and control the content and intent of their play by following their own instincts, ideas and interests. Inside play offers the chance to engage with natural and flexible materials. Shells become phones, cloths and wool ropes transform into birthday decorations and forts, nuts become chocolates, and pillows make for cozy nests. Family connections are important at Rising Song. Parents learn about the child’s school experience via a daily online photo gallery, a weekly update and bi-annual parent/teacher conferences. The teacher and families foster community by visiting after pick-up time in the front yard. Bigger social gatherings are scheduled throughout the year celebrate the seasons. The culture of our school community is friendly and connected. Parents are encouraged to deepen and enrich their child’s school experience by organizing playdates, planning family outings, providing childcare exchanges during school holidays, and helping with pick-ups and drop-offs. Since care-taking a half acre of land is a BIG job, we host regular garden "work parties" throughout the year where parents and children help implement projects or general garden maintenance.